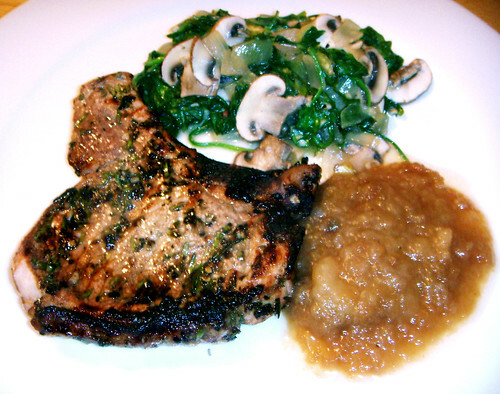 grilled rosemary and garlic pork chop with sauteed baby spinach and applesauce, originally uploaded by aarn! +25th October, 2008+. did a quick marinade of a couple pork chops with some crushed garlic, chopped fresh rosemary, a splash of canola oil, a splash of balsamic vinegar, fresh cracked pepper, and salt. sauteed up some finely chopped onions and crushed garlic in a little canola oil, then tossed in a little sherry and let simmer for a minute or so, then added a load of fresh baby spinach leaves and sliced crimini mushrooms, and covered on low heat to let it steam until the spinach was tender. grilled the pork chops up and served with a mixture of a few different kinds of apple sauce that maddie had made.